Mall retail jobs: Low pay, uncertain hours, and punitive number-crunching. For me, it was just an exhausting summer job. But for many women, it’s a living. 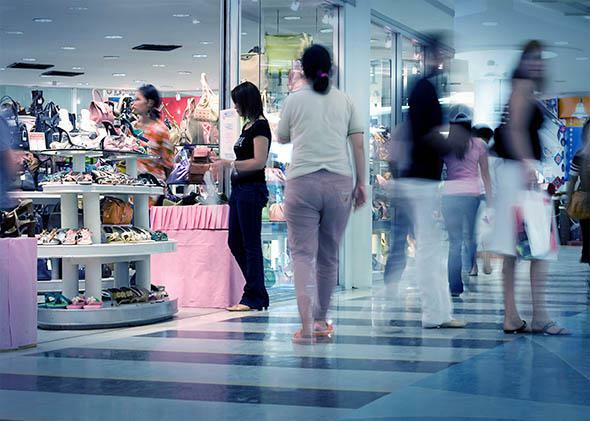 For retail employees, stringent rules and policies can make malls toxic places. Photo illustration by Slate. Photo by Kirill Zdorov/Thinkstock. It is 11 p.m., and the mall is silent. The hallways are dim and empty; the stores are shuttered. Hurriedly, I’m counting the day’s cash deposit, hoping my manager won’t find out I’ve been working off the clock. It’s the summer between high school and college, and I’m working at Icing, a costume jewelry and accessory store owned by the same corporation as ubiquitous accessories outpost Claire’s. Though Icing is aimed at an older demographic, the two stores have lots in common: $5 necklaces, bedazzled phone cases, flimsy but ultratrendy handbags, and of course free ear piercing (“free,” that is, with a $20-to-$60 “starter kit,” including earrings and cleaning solution). I began work as a sales associate in the summer of 2012, earning the Massachusetts then–minimum wage of $8.50 an hour. As a high school student looking to make some extra cash, I thought it didn’t seem too bad a gig. But between uncertain schedules, unpaid overtime, and constant pressure to meet sales goals, I soon found myself overwhelmed and exhausted. Last August, the New York Times covered the erratic schedules of Starbucks employees at the mercy of “on-call” scheduling. Icing, too, requires that employees work “on call,” meaning I often did not know if or when I was needed until an hour before my shift. For an 18-year-old with few other obligations, this uncertainty was frustrating at most. But as the Times reported, not having a set schedule is nightmarish for employees with young children who must scramble at the last minute to find child care. Similarly, I could only shrug when I’d call in to find out that my scheduled shift had been canceled due to slow business. While it was an unwelcome blow to my paycheck, I was not depending on the money the way my older co-workers were. According to the U.S. Bureau of Labor Statistics, the median age of a retail employee is 39. While the median salary from a retail job is only slightly over $20,000 a year, a 2008 study by the New York–based Fiscal Policy Institute revealed that most of the state’s retail workers serve as the primary source of income for their families. These employees can’t afford to have their hours cut back on a moment’s notice. In the past year the legality of “on-call” scheduling has been called into question. Last summer, not long before the Times-driven Starbucks controversy began heating up, a Victoria’s Secret employee in California filed a lawsuit against the lingerie chain, arguing that its unpaid on-call shifts were against state labor laws. Though the case was ultimately dismissed, the New York attorney general is currently investigating 13 large retailers—including Gap, Target, and Abercrombie & Fitch—for their on-call staffing policies. Notably, these policies disproportionately affect female employees. Though the Bureau of Labor Statistics reports that women make up roughly half of the nation’s 4.5 million retail employees, they hold nearly two-thirds of low-wage cashier and sales-clerk jobs—the kind subject to last-minute calls in and cancellations. Men are more likely to work in higher management positions with more reliable hours. Additionally, women are more likely to be the primary caretakers of children and thus less able to leave the home on short notice for unexpected on-call shifts. While working at the teen clothing store Wet Seal in Northborough, Massachusetts, 19-year-old college student Thais Neves said she rarely received breaks, even if she was scheduled to work up to 12 hours. Only when she complained to her manager did she get any time off to eat; her breaks always disappeared two or three days later. “It was like they’d give me a break now and then just to shut me up,” she said. Making matters worse, constraints on payroll—the net number of hours for which a store is allowed to use staff—often force employees to work off the clock to finish tasks. I closed Icing alone for the first time in May 2013. I had just been promoted from sales associate to full-time keyholder, and I was eager to prove I could handle the additional responsibility. Yet as I reviewed the lengthy checklist of closing tasks—vacuuming, Windexing mirrors, counting registers, completing paperwork—I knew there was no way I would finish in the 30 minutes allotted me. “You were here till 10:30?” my stern, mid-30s manager asked me incredulously the following morning. Embarrassed, I assured her I would become more efficient with practice. Yet try as I might, I could not get the store closed before 10, and my manager was unforgiving. Fearful my slowness might cost me my job—which had been tough to come by—I came up with a solution. At 9:30 p.m., far from finished, I would close the registers and clock out, saving myself another talking-to—and forfeiting pay for the rest of the night. Forcing individuals to work off the clock is, of course, illegal, and against Icing’s company policy. Yet given the strict limits many corporations place on payroll, it is not unusual for employees to forego pay so as to avoid upsetting management. Autumn Soendker, a college student who spent several years working for a chain shoe store (she did not wish to disclose her employer’s name), recalled one especially stressful night when she worked for free. The store was preparing for a large sale, and significant changes needed to be made to the sales floor. “It just took way too long to do in my shift,” said Soendker, who gave up compensation for the extra two hours. Other employees have actually been instructed by management to work off the clock. At Wet Seal, Neves said she regularly stayed overtime without pay in order to complete a mandatory theft-prevention exercise. Early in the day, a manager would hide a snap-on sensor—the kind attached to clothing to prevent shoplifting—in a random location throughout the store. Employees were required to find the sensor before they were allowed to leave and could be made to stay up to half an hour past the end of their shifts—but not on the clock—in order to do so. Though Thais recognized that the practice was illegal, she did not complain for fear of angering her managers. But last-minute calls to work, skipped breaks, and unpaid hours weren’t the most stressful aspect of mall retail. At Icing and many other chain retailers, the entire process of selling merchandise is a game of numbers. Every hour, I calculated and recorded a handful of figures: average dollar sale, average items per sale, net sales, and sales left to meet the day’s goal. Of these, average dollar sale, or ADS, was by far the most important. At the end of each shift, individuals recorded their daily ADS both in a company binder and publicly, on the store’s back door. A lower-than-average ADS was cause not only for nagging—and, at times, shaming—from management, but also led to reduced hours. In theory, the concept of ADS makes sense. Because customer traffic—how many customers enter the store on any given day—is largely out of employees’ control, the best way for a store to maximize its profits is to focus on selling as much as possible to individual customers. Icing’s rhetoric framed selling as an act of “servicing” or “helping”; if your ADS sank too far below the target $20, that meant you were not giving customers the attention they deserved. Neves says she often struggled to meet what she saw as “extremely unrealistic” sales goals. Managers “were always cracking down on us,” she says. At many large chain retailers, ADS and other sales-related statistics play a tremendous role in how individual employees’ performances are assessed and their eligibility for promotion. In July 2014, Soendker’s assistant manager left and Soendker assumed many of her responsibilities, including training new employees and taking care of payroll paperwork. Though she was told to introduce herself to customers as assistant manager, she continued to receive only a keyholder’s paycheck: Her numbers were not high enough to justify a formal promotion. Employers’ emphasis on numbers can breed competition and animosity between employees. Corinne Bourque, a former associate at the skate shop Zumiez, said her manager would frequently ring Bourque’s sales under her own name. “She stole my sales, and then she would get mad at me because my numbers were so bad,” Bourque says. I left Icing in August 2013, with a meager paycheck and new insight into a frantic, high-stress world I hoped never to return to. But as I locked the door of the shop for the last time, I was acutely aware of the privilege that allowed me to say with confidence that I wouldn’t be coming back. There are millions of Americans still working retail who aren’t so lucky.